Update: Based on the first cast photo released for the film, titled Fantastic Beasts: The Crimes of Grindelwald, it looks like we were right, because Dumbledore is holding the mystery wand we wrote about. The famed Elder Wand had a long and dark history, starting from the first night it was created in the legend of the Deathly Hallows, until centuries later when Harry Potter snapped it in half so it could never again be used to kill. But long before Lord Voldemort stole it from Dumbledore’s grave, another infamous Dark Wizard possessed it during his own reign of terror. And based on a photo shared from the set of Fantastic Beasts, the most famous wand ever made is going to be showing up in the franchise’s first sequel, alongside an all new wand we’ve never seen before, one that could possess its own unique powers. But more importantly, it might explain how Dumbledore defeated Gellert Grindelwald during the most famous duel in wizarding history. The Fantastic Beasts twitter account posted this photo of two wands. The one on the left, with the pocked surface and round bulbs, is unquestionably the famed Elder Wand Harry Potter fans know all about. It was the wand Dumbledore used, and it became a major focal point in battle between Harry and Voldemort in the last book and movie. But it’s the one on the right which seems to be a wand no Muggle has ever seen before. Notice how it looks like the complete inverse of the Elder Wand, both because it has a smooth, shiny finish, and also because the protrusions of the Elder Wand almost seem to fit perfectly into the grooves of the mysterious new black wand. We know that Dumbledore didn’t come into possession of the Elder Wand until 1945, when he defeated Grindelwald in a legendary duel that helped end the Dark Wizard’s threat in Europe. In Harry Potter and the Deathly Hallows an imprisoned Grindelwald told Voldemort that’s how Dumbledore came to be in possession of it. To own the Elder Wand you had to take it from the previous owner (which usually meant killing them), but Grindelwald had stolen it years earlier from the wand-maker Gregorovitch. 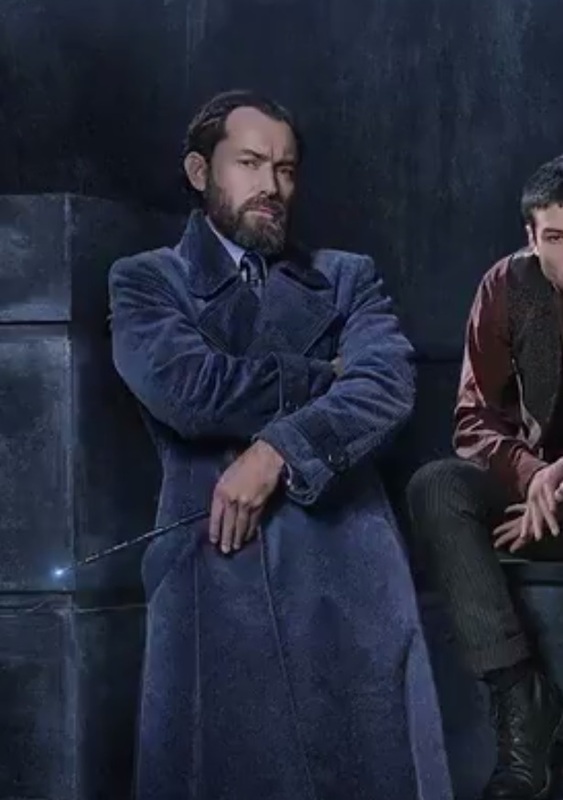 Our working theory (that we’d bet all our money on) is that the entire Fantastic Beasts series is heading towards that showdown, and we thought that even before we knew Jude Law will be playing the younger-ish Dumbledore starting with this first of four sequels. But despite having lots of information about the creation of the Elder Wand–when Antioch Peverell asked for it from Death himself, and how numerous lives were lost by wizards acquiring it over the centuries–we know almost nothing about the wand that beat it. Dumbledore and Grindelwald were two former friends who as teenagers had dreamed of ruling the world of wizards and Muggles alike as a kind of benevolent monarchy. When Dumbledore finally answered the pleas to stop him decades later, the duel that took place was said to last for three hours. Both were extremely talented wizards, two of the most gifted ever, so it’s understandable they were so evenly matched. But if Grindelwald had the Elder Wand, the most powerful wand ever created, was Dumbledore that much more skilled that his inferior wand was able to overcome the discrepancy? Or, as this photo suggests, was there something about Dumbledore’s original wand that lent itself perfectly to to fighting with the Elder Wand? If it really is a sort of inverse of the Elder Wand, did it provide Dumbledore with a unique way to beat his friend? A connection between the two would be similar to how Harry and Voldemort’s wands were connected because they both shared a feather from the phoenix Fawkes. That caused Voldemort so many problems he ended up taking Lucius Malfoy’s wand, and when that failed he became obsessed with acquiring the Elder Wand. That was the reason he killed Snape (unaware Draco had truly been the one to take it from Dumbledore). Might history have repeated itself, and could that be how Dumbledore understood immediately what happened when Voldemort and Harry faced off with one another at the graveyard in Little Harrington, when Harry and Voldemort produced Priori Incantatem (when the “ghosts” of Voldemort’s victims appeared)? This might be a lot to extrapolate from just one new wand, but one of the histories of magic in America that J.K. Rowling wrote before the first Fantastic Beasts was released, was about the wand makers in America. Could the secrets of this mysterious wand be traced back to America? Did Dumbledore partly avoid facing Grindelwald for years because he knew he didn’t have the right weapon to fight him yet? Dumbledore and Grindelwald will forever be connected, and even though we might know how their relationship ended with the most famous duel in history, there’s very little we know about how it happened. The wand Dumbledore used during that fight might hold just as many secrets and powers as the Elder Wand. And if that’s the case it raises another question: what happened to it? Did it end up playing a role years later when a second Dark Wizard followed in the robes of Grindelwald? Are the connections between the prequels and Harry Potter much deeper than we thought? We don’t know, but with this many questions raised by a single photo, we now understand why we’ll need four more movies to get all the answers. What do you think? Is this the wand Dumbledore used to defeat Grindelwald? Could it have some powerful connection to the Elder Wand? Conjure your best theories in our comments section below.